Officials at the Yale Peabody Museum confirmed that a meteorite struck a home in Wolcott at the end of last week. 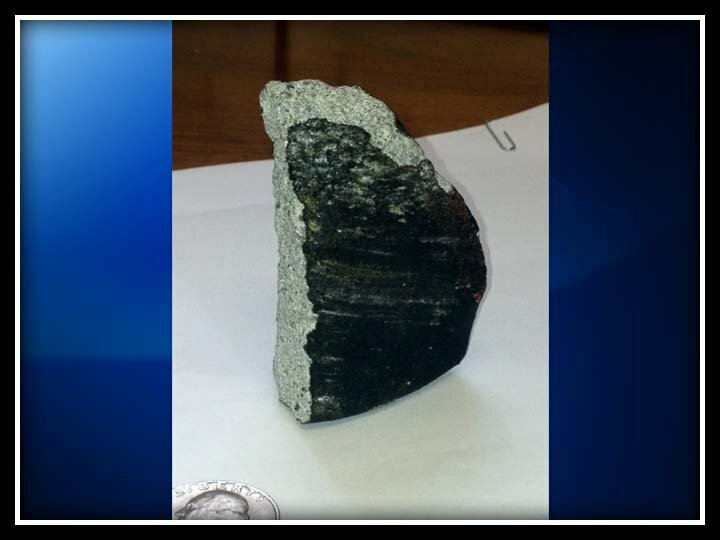 The Wolcott Police Department said local resident Larry Beck called them before 10:30 a.m. Saturday and said a baseball-sized rock crashed through his Williams Court home the night before. Beck said the rock caused damage to his roof, copper piping and cracked the ceiling in his kitchen before coming to a stop. "It sounded like a gunshot but it was louder bang," Beck said. "We looked up and saw the ceiling coming down and broke away the sheet rock in the dining room." Beck reported to police he heard the rock crash through his home Friday at 10:30 p.m., but thought that a joint or rafter had been broken. When he checked the attic the following morning, he said he found the hole in his roof, the damage to the pipes and the rock. He said the rock had broken in half. "For this to crash through asphalt shingles, the roof, smash copper pipe, crack a ceiling, it was moving very quickly," said Wolcott police Chief Edward Stephens. It was believed that the rock was possibly a broken piece of airport runway concrete that had dropped from an aircraft when the landing gear was being lowered because, Beck said, there is a lot of airport traffic over his home at all hours of the day and night. Bradley International Airport and Oxford Airport are nearby.